The final week(end) ahead of 2010! Prepare yourselves for the final week of the 2010 Drum Corps International Tour! Starting today, Aug. 6, the DCI Eastern Classic in Allentown, Pa., features the entire World Class lineup over two days of competition. After last Saturday's DCI Atlanta Southeastern Championship, the corps are hitting it hard in rehearsal to prepare for one of their last major showdowns before DCI World Championships in Indianapolis. Start your week off with the always-exciting DCI Eastern Classic in Allentown, Pa., home to one of the most knowledgeable and supportive audiences in drum corps. 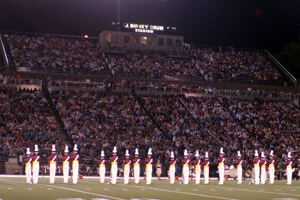 Also known simply as "DCI East" or "Allentown," the historical event was first held in 1977 and returns to J. Birney Crum Stadium. On Friday, you'll witness current-leaders Blue Devils up against Carolina Crown, Blue Stars, Glassmen, Troopers and six other ensembles. Saturday's event features Allentown's own Cadets along with 11 World Class corps. The evening will conclude with a very special exhibition performance by Bayonne, N.J.'s Bridgemen Alumni. While the first day of the DCI Eastern Classic entertains audiences in Allentown, the East Coast Classic takes place in Lawrence, Mass. Beginning at 7:30 p.m. at Lawrence Veterans Memorial Stadium, watch the competitive performances of Boston Crusaders, The Cadets, Bluecoats, Mandarins, Pacific Crest and Teal Sound; and be sure to stick around for the all-age Crusaders Senior and the Muchachos. On Saturday, the city of Belding, Mich. will host one of the last Open Class events of the regular season on August 7: Nine Open Class corps will face off at Silk City Rhythms beginning at 7 p.m. on Belding H.S. 's Rudness Field. On Sunday, you have not just one, or even two, but four different drum corps events to choose from. 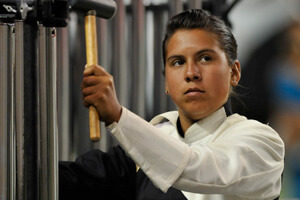 Beginning on the East Coast in Clifton, N.J., there are eight exciting corps competing at Music in Motion – New Jersey. See the exciting competition between Carolina Crown, the Cadets, Madison Scouts, Mandarins, Phantom Regiment, Blue Stars, Colts, and the hometown corps Jersey Surf. In New York, seven other World Class corps will be competing at Drums Along the Waterfront starting at 5:30 p.m. You'll also see and hear the performances of three alumni corps and special guests the United States Marine Drum and Bugle Corps. Meanwhile, in the Midwestern area of the United States as corps make their way to Indianapolis, Music on the March 2 begins at 7 p.m. in Dubuque, Iowa. See eight Open Class ensembles compete on Dalzell Field at Dubuque Senior H.S. : Blue Devils B, Oregon Crusaders, Revolution, Raiders, Racine Scouts, Les Stentors, Forte, and Dubuque's own Colt Cadets. In Dayton, Ohio, more Open Class excitement will entertain audiences at the Dayton Summer Classic at Northridge Stadium. Don't miss Velvet Knights, 7th Regiment, Spirit of Newark/New Jersey, Genesis, and seven more! The last regular-season event before the DCI World Championships is the Summer Showcase, Monday in Toledo, Ohio. Hosted by the hometown corps Glassmen, the event also showcases Blue Knights, Santa Clara Vanguard, Cascades, Pioneer, Pacific Crest and Crossmen. This exciting event also includes the Glassmen ENTERTRAINMENT educational clinic, running from 4 – 5:30 p.m. at the stadium. All local educators, students and fans are invited, and admission is free with purchase of a ticket to the evening show. 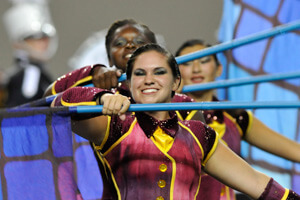 Championships Week excitement starts Tuesday with DCI World Championship Open Class Quarterfinals in Michigan City, Ind. All participating corps will compete on the stage at Ames Field, before the Open Class Semifinals at Lucas Oil Stadium in Indianapolis. From 7th Regiment to Velvet Knights, this diverse lineup of corps will no doubt put on an entertaining competition to officially kick off the week. From Thursday, Aug. 12 through Saturday, Aug. 14, weeks of hard work, development and passion culminate in three days of competitive excitement. At the DCI World Championships, Open and World Class corps will showcase their 2010 programs in the quest for the World Championship title. Learn more about the 2010 DCI World Championships.